The term sarcophagus is derived from the Greek (lit. 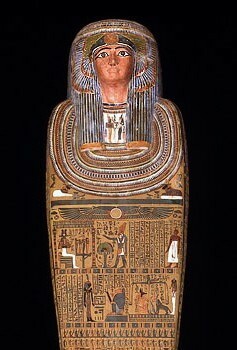 'flesh-eater') to refer to the coffin in which the mummy was placed with the intention of protecting it. The oldest known burials placed the body into the ground without any treatment or protection, which resulted in a natural form of mummification due to the warm, dry sand. As soon as a protection was placed around the body in the form of a coffin, this resulted in the body decaying, and it is assumed that this was one of the reasons why the Egyptians turned to mummification. During prehistoric times the body of the deceased was wrapped in mats or cloth or covered in a basket to protect it from the sand, and later a simple coffin consisting of a few planks was developed. The body was placed inside on its side with its legs drawn up. In the Old Kingdom the body was buried lying on its back; the coffins became longer and more elaborate. Towards the end of the Old Kingdom, representations of food began to be painted on the inside of the coffin, designed as replacements should the real offerings in the tomb cease. At this time two eyes were also added to the coffin, on one of the long panels, usually at the level of the deceased's head. At the burial these eyes faced east (in theory at least). The idea behind this was that the deceased would not only be able to see the rising sun through them, but also the offerings brought to him from the east - after all, the tomb was in the west. The opening often made in one of the walls of the serdab is another example. Particularly in later periods, the eyes also had a protective role (see 'wedjat'-eye). In the 1st Intermediate Period, the number of objects depicted on coffins began to increase, virtually everything considered of importance to the deceased is shown. At the same time the Coffin Texts appear, intended to assist the deceased in his afterlife in the underworld. They also contain (adapted versions of) the Pyramid Texts and sometimes, on the bottom of the coffin, a map of the underworld (compare the later books of the underworld, such as the Amduat). During the Middle Kingdom the anthropoid sarcophagus appeared, which associated the deceased with Osiris through its mummiform shape, the beard and the crossed arms. From the 3rd Intermediate Period on, the funerary scenes which used to be on tomb walls as well as on papyrus were painted onto the sarcophagus itself (but also still on papyri). Important motifs include the last judgement, the journey through the underworld, and the resurrection, all connected with the myths surrounding Osiris and Re. In later times parts of the Book of the Dead were inscribed on the sarcophagi. Among the gods most frequently illustrated are the goddess Nut (often on the inside of the lid) and the goddess of the west, or Hathor, on the bottom of the coffin. The mummy was often buried in more than one coffin, the outermost usually being rectangular and, certainly from the New Kingdom on, the innermost anthropoid. Famous examples are those of Tutankhamun, who was buried in a set of three nesting anthropoid coffins placed into a rectangular sarcophagus. The term 'sarcophagus' properly speaking refers to a stone coffin, but Egyptologists tend to use the terms 'sarcophagus' and 'coffin' indiscriminately, regardless of material or shape.